New and Useful Organisms Discovered in a Surprising Place! This week I found an article from Discover Magazine (“New Life in a Death Trap” by Edwin Dobb), in the year 2000, about a polluted mining pit outside Butte, Montana. Butte was one of the greatest mining areas in the world for almost a hundred years. The article says that at one point, its mines produced one-sixth of all the copper used in the world. However, the decades of mining changed the local ecosystem forever. A large pit began to fill with runoff from the mines. Now, this place, called the Berkeley Pit, is one mile long, half a mile wide, and filled with mining runoff that was so polluted that almost nothing lived in it. 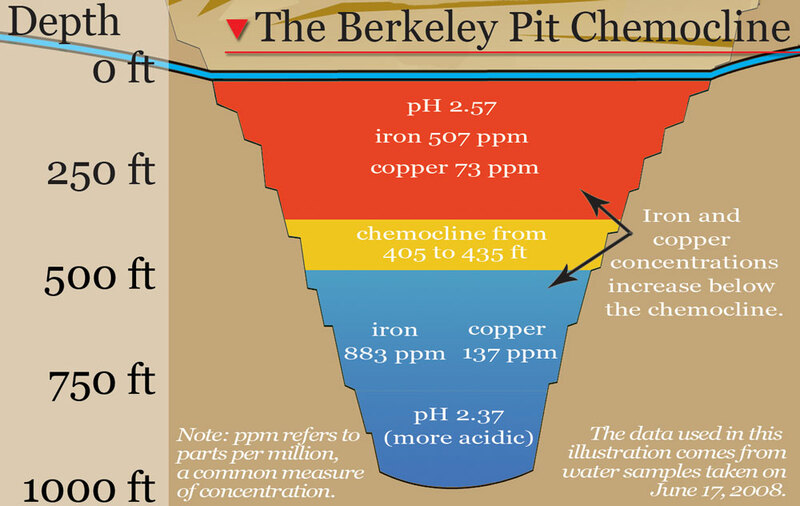 The water, which is as deep as 1780 feet in the pit, has a pH of 2.5 (as you can see in Figure 1), “about the same acidity as Coca-Cola or lemon juice.” The entire ecosystem has been changed drastically by the acidic water present in this pit. Before I read the article, I would have thought that long stretches of time would eventually help the surrounding ecosystem clean itself up. But, as I read on, I learned that these rules don’t apply in the Berkeley Pit. The ecosystem has changed so dramatically that is has created a positive feedback loop: The acid from the mine water runoff now leaches into the rocks that form the walls of the pit. These walls are made from stone layers rich in sulfide mineral deposits. However, when the rock dissolves and the sulfides are released, they create sulfuric acid and the water gets even more acidic. The positive feedback loop cycles again, with a more polluted pit than before. The article focuses on a husband and wife team of scientists, Dr. Andrea Stierle and her husband, Dr. Don Stierle. They research samples of the water in the Berkeley Pit to find out what is surviving in the water. Most of us would be concerned as to how this ecosystem could get back on track. The normal consumers and decomposers are killed by the toxic water in the pit. Another scientist at the Montana Tech School of the University of Montana, Grant Mitman, is also studying what new decomposes have evolved in the face of the modern pollution in Butte. He found “some rope coated with brilliant green slime.” He identified it as “Euglena mutabilis”, a single celled green algae that is new to this pollution site. Algae have actually evolved so that it thrives in the acid and heavy metal ecosystem. Don and Andrea Stierle have called this an example of “biorational serendipity.” That means that out of a terrible ecological disaster like the Berkeley Pit, scientists can make educated guesses and hypotheses about the new organisms that may evolve there. If their predictions are correct, then some of these new “extremophiles” can actually be beneficial. For example, one substance called taxol, found in the pit, can be used to treat ovarian and breast cancer. The Stierle’s favorite story about their research comes out of a tragedy. In November, 1995, a flock of hundreds of Canadian geese were flying in stormy weather, and needed a place to land for the night. The geese all flew down and settled on the water of the Berkeley Pit. By morning, more than 350 geese were dead, floating in the acidic water. In just a few hours, their digestive tracks were full of blisters and lesions from swimming in and drinking the water. By the time this article was published in 2000, the Steirle’s had made an amazing discovery. There were new “microbes” breaking down some of the heavy-metal toxic compounds in the lake. Some of these had evolved from organisms that had previously only been found in the large intestines of geese. When the 350 geese died by landing in the pit, they accidentally released microbes that might some day clean the lake up. This is a very interesting story. I never thought algae could be an extremophile, but it does make sense. Algae are known to thrive in waste water and can remove heavy metals from polluted water. This strain of algae that can survive in the acidic water may help to remove some of the pollution. Also I wonder if it is possible to stop the positive feedback loop so that the water stops getting more acidic. Is there a point where the loop will have to stop(no more sulfides or the pH is too low)? It is good that some positive research can come out of it. I think that this post is so interesting. You did an amazing job connecting the way an ecosystem works and the way that the ecosystem of the Butte, Montana had to drastically change. It’s really cool that the algae has been able to evolve, it reminds me of natural selection in a sense. I also think that it is super cool that the algae could actually help get rid of the pollutants in the water. My only question to you is, what kind of microbes did the geese release and why did they survive over others (what is so different about them)? Overall, this was a really well written and fascinating blog post. You did a great job!